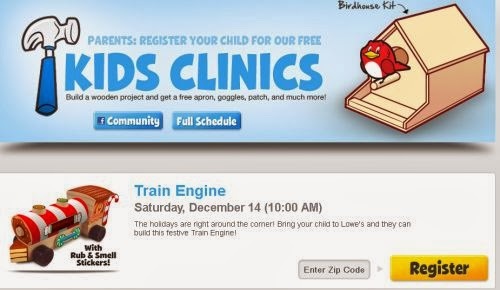 Freedom Rockz: Hey kids Make a Free Train Holiday Engine! Hey kids Make a Free Train Holiday Engine! Hey kids make a free Train Engine! When: Saturday, December 14, 2013 at 10:00 AM. Get the kids in the holiday spirit for free! Take your child to your nearest Lowe's and they can build this cute Train Engine with scratch & smell stickers! Click the link below to go to the Lowe's website get them registered for free.